BUT DON’t KNOW what to do next? You’ve got a killer idea for a course, maybe even some great lessons planned out. After all, you’re an expert in your field. How do you begin to pull it all together to make it as successful as you know it can be? …and don’t forget all those hours of editing that need to be done. It can be super overwhelming! You need someone on your team who’s been there, done that, and can guide you step-by-step through the process – so you can see the light at the end of the long, winding, course creation tunnel. If you want the best results, you hire an expert. Someone who can simplify the process, focus your efforts and empower you to succeed. I’ll help you take your course from where it is right now, to where it deserves to be – making you money, establishing you as an authority in your niche, and in the hands of your ideal students. The kind of students who can’t stop telling their friends, family and their neighbours’ pets about this brilliant course they’re taking and the really intelligent and creative person who made it all possible for them. Nick from Living to Roam helped us streamline and automate our small business so we could scale and handle course launches with less stress. He is super responsive, incredibly well documented, and generally provides a wealth of information about how to make online courses more successful. We have really enjoyed working with him! Nick is the 360-degree online marketing guy we all seek at some point. I was very impressed by his efficiency and straight-to-the-point advice. As an online course owner and tech startup expert, Nick was able to define what I should do next to leverage my online brand and increase my online reputation. Thanks again Nick! Step 1 – Click ‘Get Started’ anywhere on this page and fill out the short form. Step 2 – I’ll invite you to a free 30-minute discovery call over Zoom. Step 3 – If we both feel like we’re a good fit, we can discuss working together. If I can’t help, I’ll refer you to someone who can. Step 4 – The magic happens. I’m Nick, nice to virtually meet you. I’m a passionate course creator, co-owner of Living to Roam and digital marketing consultant. When I’m not working behind the scenes helping course creators like yourself kick goals, I’m usually eating a lot of hummus and obsessing over the finer details of Australian football. As a fellow course creator myself, I get it. You see I’m one of those (super weird) people that love planning content, crafting clever marketing strategies and just generally making things happen like clockwork for other entrepreneurs. Call it a Spidey-sense for organisation and getting things done. I’ve been in your shoes, and I know how hard you’re working to make your online course dream a reality. I want to help you get there by providing you with the tools and the know-how so that you don’t feel alone in the process. PS. If you’re a fan of Teachable, then we’re going to be virtual pals, I just know it. 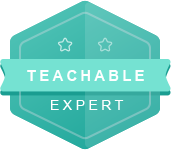 As my ultimate favourite course platform, I’m honoured to have received this shiny badge from them – so you know you’re in safe hands.